The police are looking for three suspects who allegedly punched, kicked and robbed a 34-year-old man on a Sunnyside street corner last week. 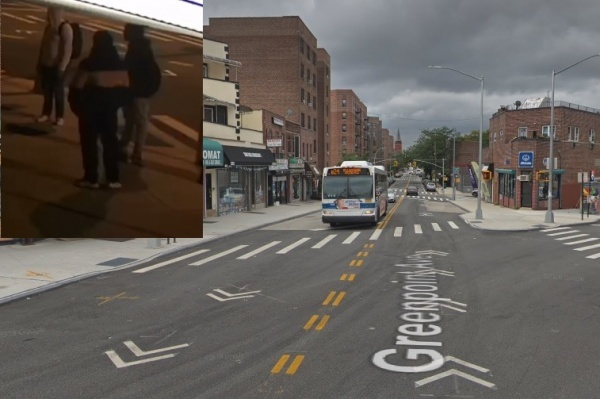 The victim was walking on the corner of Greenpoint Avenue and 48th Avenue at around 11:20 p.m. on Monday, March 11, when the suspects approached him and began to yell at him. Video then shows one of the men throwing a sucker punch, knocking the man to the ground. The suspects then kicked the victim and took his wallet, which contained $600, an iPhone X and Apple earpods, before fleeing in an unknown direction, according to police. The victim was taken to Elmhurst Hospital where he was treated for bruises to the head and body. The suspects are described as black and in their twenties. One of the men had long braids, white jacket and blue jeans. The police have released photos and video of the suspects taken near the incident. You trolls here in the comments section always blame the mayor, or the governor, or the President, or our lord and saviour Jesus Christ, or the Communists, or whoever’s at hand. Real geniuses. How about the fact that villains will always try to take advantage of a person with an obvious glut of cash and personal possessions? It’ a no-brainer. Hey, not for nothing, but don’t walk around town with $600 cash on your person. Conspicuous display of wealth only works for people with bodyguards. Where are our representatives? Where is Jimmy Van Bramer when he’s wanted. He appears to chase away jobs and tear flyers off of lamp posts. Where is he now? Looks can be deceiving. I’ve seen homeless people scrolling smartphones. we need to get rid of the shelters, sunnyside is not a ghetto! we deserve to feel safe in our neighborhood without these ridiculous, trashy people walking around! WHO ARE THEY TO FEEL ENTITLED TO OUR HARD EARNED MONEY, THEY’RE FREELOADERS USING THE GOVERNMENT RESOURCES AND BEING LAZY! Homeless shelter down the street bringing drugs and bad things to the neighborhood. Those kids dont look like they are from the shelter. Stop blaming everything on the homeless shelter. Homeless shelters connection to this? Not scapegoating, but this kind of stuff never happened beforehand. I’m sorry, are you saying this is the first mugging in the history of Sunnyside? This kind of crime is an epidemic all over the boroughs. Something must be done to stop it. I know it’s easy to say but how. I was thinking public flogging or much stiffer punishment or both. An example of what will happen might stop the predators. The parents of these thugs should be punished and shamed also. If these kids were raised right, they might not attack innocents. These thugs probably don’t even know who their fathers are. Grew up on welfare, living in the projects. Their mothers probably had 5 kids, each with a different man. And the city pays for all of this. It isn’t racist if it’s true. I didn’t see anything about race mentioned in that comment. Do you think its right to say that because someone committed a crime, they also grew up on welfare and that their mothers had 5 kids with different men? Would “Citi pays” have said that if these were white kids? The racism was implied in what was stated. “Dear Boss” what is your proof that statement is true? Don’t be so narrow minded. Blaming the homeless shelters, or circumstance of growing up is BS. People make choices in life. The city doesn’t pay for all of this: WE DO!!! Wow, ANOTHER racist Trump supporter?! This is becoming a sh*t hole of a city. Selling my home in LIC and getting out, from our politicians JVB,Gianaris, crappy dangerous public schools, high taxes, terrible quality of life,dirty streets, and pissed off people walking around trying to take what’s yours the product of your hard work, its not worth it- enough already. Time to get out of here. If you come down South or Texas don’t be bringing your Liberal voting and spread your cancer here too. Vote Conservative across the board! Oh and bring plenty of your own money because this is low wage Texas and you’ll earn dirt as a wage. People just kept driving, great job people. Also why wouldn’t you put the picture of the scum in your article, it’s at 35 second mark of the video. Can someone tell 108 to start getting more aggressive on these crimes? When are we going to start seeing more results on these small crimes? How much of 108’s salaries is coming from Sunnyside? We demand more active police presence and faster responses to these crimes. Bill, they are not just cowards, they are scum of the earth, like cockroaches, these people need to be punished severely. This is not a “mistake” a “good kid” did. It’s intentional, and can be pursued as attempted murder, not just assault. They are kicking the person on the ground. Scumbags hope they catch them soon. Definition of a coward is to jump someone alone late at night with two or three pals. Bill – a coward is also a slimeball who attacks somebody who didn’t do anything to them and then they run. When they catch them they should be taken outside and squashed. But they had no weapons on them so stopping and frisking them would have done nothing to prevent them from jumping this person. Sooo….. IDK what racist policing policy would have done to help out. Marching through Sunnyside we’re the Billy boys. I’m going to say it again, why don’t we ever have police presence in our neighborhood? Is that so much to ask for????? I come through that area regularly after midnight and it’s very quiet. I’ve never felt threatened or in any way in danger. Sure, the cops shouldn’t be absent but there’s nothing that requires a “police presence” and certainly no need to re0-visit the mistake that was stop & frisk. I have a feeling that its fans will never stop croaking “stop & frisk” even as our neighborhood grows safer and safer. A cop on every corner of every street? Please that’s just dumb. Easier for them to sit in their patrol cars ticketing expired registrations. We don’t have much police presence in this neighborhood because these things are pretty infrequent. We self regulate pretty well. Invariably, the offenders turn out to be the usual suspects from elsewhere. Lets have the cops feel you up for weapons bud. Actually gentrification would help. The low life uneducated scum wouldn’t be able to afford to live there and would move. You do realize that the scum can travel to do their crime and leave? I highly doubt these guys were Sunnyside residents. You might be right but it’s also highly possible that they live locally. Groups of thugs do not travel to our area and hang out on Greenpoint Avenue. It’s not really a destination, more like a place in the neighborhood where thugs might gather.